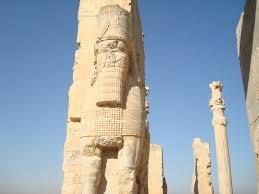 This article describes various ancient Persian arts like architecture, sculptures etc. Bounded by fierce mountains and deserts, the high plateau of Iran has seen the flow of many migrations and the development of many cultures, all of which have added distinctive features to the many styles of Persian art and architecture. The term “Persia” derives from a region of southern Iran previously known as Persis, or Parsa, which itself was the name of an Indo-European nomadic people who migrated into the region about 1000 BCE. During the Achaemenids reign, luxurious works of decorative art were produced. The Achaemenids evolved a monumental style in which relief sculpture is used as an adjunct to massive architectural complexes. Remains of great palaces reveal plans that characteristically show great columned audience halls. The style as a whole and the feeling for space and scale are distinctive. Sassanian metalwork was highly developed, the most usual objects being shallow silver cups and large bronze ewers, engraved and worked in repoussé. The commonest themes were court scenes, hunters, animals, birds, and stylized plants. The largest collection of these vessels is in the Hermitage Museum, Saint Petersburg. The Safavid Dynasty (1499-1722) is of particular note because the reigns of Shah Tahmasb and Shah Abbas created and funded weaving workshops featuring high-quality artisans and materials. Artists would create the carpet designs, and the best weavers in the empire wove the best designs. This constituted the Golden Age of Persia. At that time, trade was established with Europe. The conquest of Persia by Alexander the Great in the 4th century BC brought about a blending of Persian and Hellenistic styles, seen, for example, in the bronzes, pottery, and jewelry of the Parthians. During the Mongol Timurid dynasty (1369¬1506) Chinese influences were apparent in the development of one of Persia’s greatest artistic achievements, the miniature, which was used to illustrate books of poetry, history, and romances. 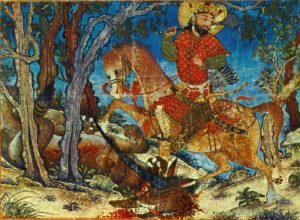 Persian miniature art has developed its own distinctive features. Whether it’s being displayed in museums, casino hotels, or in private collections, Persian art has its own distinct features. For instance, Iran’s miniature artists are recognizable for their emphasis on natural and realist motifs. Also worth noting is the Persian technique of “layering” perspectives to create a sense of space. They have strongly influenced buildings throughout much of the Islamic world, especially in Central Asia, Afghanistan, Pakistan, and India. Today, Iran remains a country rich in traditions, with a culture which has had great influence on other countries, both in Central Asia and throughout the world.